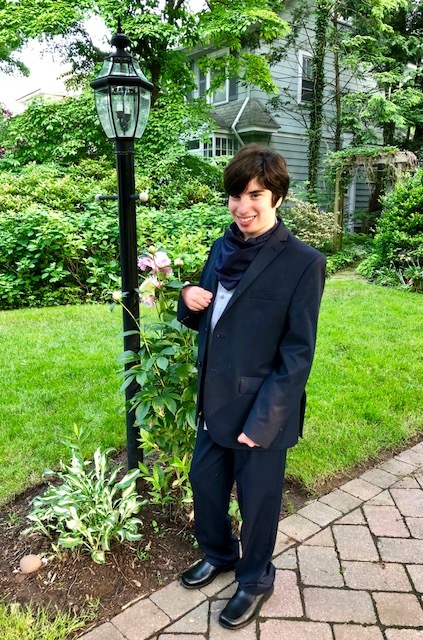 Friday night was Max's first prom. He'd been looking forward to it for weeks. "ROM!" he called it (he can't yet say "p's.") The plan was for me to drive him there, walk him in, then leave. I took a few photos before we left. As Max stood in front of the stairs, they suddenly seemed a little empty. His suit lapel looked a little bare without a corsage pinned to it. Max doesn't know that people take dates to proms, and he didn't seem to care. Me, I get a little melancholy at life milestone moments like these. I rarely have those what-if pangs anymore—as in, what if Max didn't have intellectual disability. But standing in front of the house on prom night and taking photos of him looking so handsome and alone gave me pause. My head knows not to feel sad that Max doesn't fit into the cultural norms: he has a good life, he is happy, he is content with who he is. My heart, not so much. When we pulled up to the catering hall, Max spotted his friend J and squealed. I let him out of the car and he ran over and gave her a hug. I parked and found him inside, giving people high-fives left and right. "Are you Max's mom?" two boys asked, and suddenly I understood how celeb handlers felt. I asked Max to take a photo in front of the Hollywood themed step-and-repeat. A classmate wanted to be in one with him. Right before I took the photo, she kissed his cheek. Max cracked up. "Did you just kiss Max?!" his teacher asked. Yep, she had. What happens at prom stays at prom! Then another student approached. "I want to take a picture with Max!" he declared. Max settled down at the table with his classmates. A waiter set a plate of salad down at his place. I was about to say "He doesn't eat salad!" but I held back. Who wants their mom sending back food at prom?! I waved goodbye, then hovered outside. I asked a server what was on the menu and she mentioned turkey and roast beef. I requested pasta for Max, since he can't chew that stuff. The principal walked by. "Don't worry, it's a buffet, there's pasta there!" she said. "He'll be fine." The night ended at 10:30, which is late for Max; he usually crashes around 8. I got there at 10:15 and the principal and assistant principal were sitting outside the room. "He had the best time!" she told me. I walked in and found Max rocking out on the dance floor, a yellow lei around his neck. He didn't want to leave. And that was prom, a night filled with friends and fun. It was Max's idea of a great time. And really, that was all that mattered. I hadn't ever thought about my kiddo going on his own, but I think it would go down much like this. Thanks for sharing! 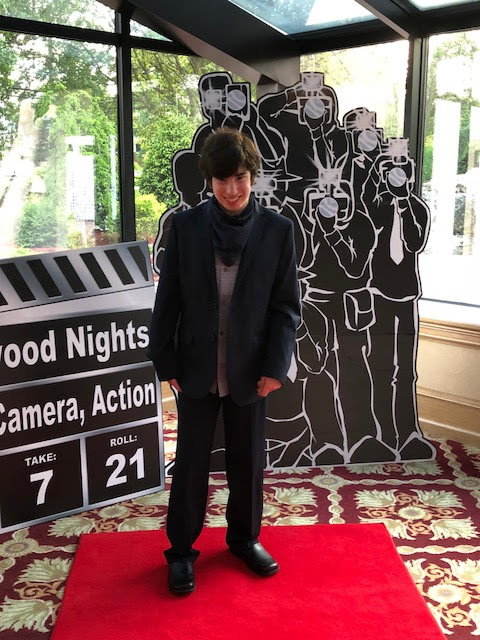 Sounds like he had a blast - and he looks SO handsome!